In March 2017 Brass Tracks made its way to the Carnegie Hall. However, the famous line ‘How did You Get There?’doesn’t quite seem right when its explained that it’s the Carnegie Hall in Dunfermline, Fife. Nonetheless, there is still much anticipation and nerves of playing our own concert there. Not to mention the last minute panic of replacing our replacement tuba player! Discovering at the eleventh hour that our dep tuba player had fallen ill in another rehearsal and realising many other tuba players were involved, like our permanent tuba member, in the Scottish Brass Band Championships in Perth, we would have very few if any suitable tuba players to join us last minute. Luckily, all was saved by our French horn player who knew of a very good tuba player who was not in a brass band and was available. 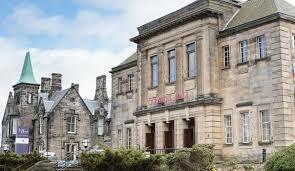 Dunfermline’s Carnegie Hall is a small jewel in the heart of Scotland’s former capital over three hundred years ago. A lot of course has changed and developed since, like the addition of this hall that is predominately used as a theatre with adjoining halls and rehearsal spaces, cafe bar and annex. Our audience that evening – many of which are members of the Dunfermline Arts Guild in which we were being supported by, were very enthusiastic and warm in their welcome. Our programme of music continued our journey through Italian Renaissance and eventually by the second half reached the foot tapping tempi of The Great American Song Book.